Issues, interviews, and insights into the U.S. housing market. Twice monthly takes on what’s happening in the housing market today, and what might be happening tomorrow. From the John Burns Real Estate Consulting team. Dean manages residential and commercial real estate consulting assignments across the country and has deep knowledge of California’s Bay Area, Sacramento, and Central Valley markets as well as Northern Nevada. Dean specializes in aggregating housing market trends and conducting primary research, including consumer research, to recommend the product segmentation that will maximize price and absorption for specific target buyer profiles. Before joining John Burns Real Estate Consulting in 2010, Dean managed market research consulting assignments for 11 years at several national housing market research firms. Dean has a Ph.D. from the University of California, Los Angeles and a B.A. in Political Science from Cal State Fullerton, and works in our Sacramento office. Dean plays basketball when not injured, writes novels and screenplays, and almost always wins at Trivial Pursuit. Almost. The spring 2019 selling season is here. Enjoy Jody Kahn, Devyn Bachman, and host Dean Wehrli as they bring you the most insightful clarity on new home sales you will find anywhere. For those of you who are not clients, enjoy this taste of what our clients receive all year long. Two self-described “Designistas,” Megan Eltringham from The New Home Company and Matt Sauls from Pardee Homes (TRI Pointe Group) share their thoughts on the payoff for spending the time and money to design great homes. Will Duderstadt, VP of Marketing at M/I Homes, brings clarity to effective digital marketing strategies. Our consulting leaders Dean Wehrli, Lesley Deutch, and Pete Reeb provide tremendous insight on the rising incentives required to sell a home today. Consumer Insights Manager Sidney Pell shares what baby boomer execs need to change to sell and rent more homes to millennials. The home building industry is rapidly changing in some very exciting ways. In part two of our CR Herro interview, we discuss the new technologies that are allowing homes to be built better than ever and the adoption of smart home technology. Episode 12: Lower Mortgage Rates for Energy-Efficient Homes? CR Herro the VP of Innovation at Meritage Homes, articulates changes coming to the new home industry. In part one of a two part series, Dean and CR discuss the impact of building energy-efficient homes. Margaret Whelan, an industry investment banker who has successfully raised money for several innovative housing companies, explains why this time is going to be different with respect to off-site construction. Dallas Tanner, the Chief Investment Officer who co-founded Invitation Homes in 2012, shares with us the future of rental homes. Dean discusses the state of smart home technology with Todd Tomalak, SVP at John Burns Real Estate Consulting. Dean Wehrli interviews Alaina Money, the CEO and Founder of Garman Homes, about her journey into her leadership role within the housing industry. Dean interviews John Burns regarding the 4-5-6 rule for demographic-based decision making, which is covered in chapter 3 of the book Big Shifts Ahead. Dean talks with our Chief Demographer Chris Porter on the concept of surban™. Dean talks with three millennials from John Burns Real Estate Consulting on their generation’s perception of the housing market. Dean talks with Rick Palacios Jr., our Director of Research, on the quickly evolving single-family rental (SFR) industry. To start us off we have John Burns in to tell us where housing is heading over the next couple of years. We talk about some key factors that will impact the cycle near term and some strategies to ride the wave instead of being pulled under. Episodes will be released every other week. 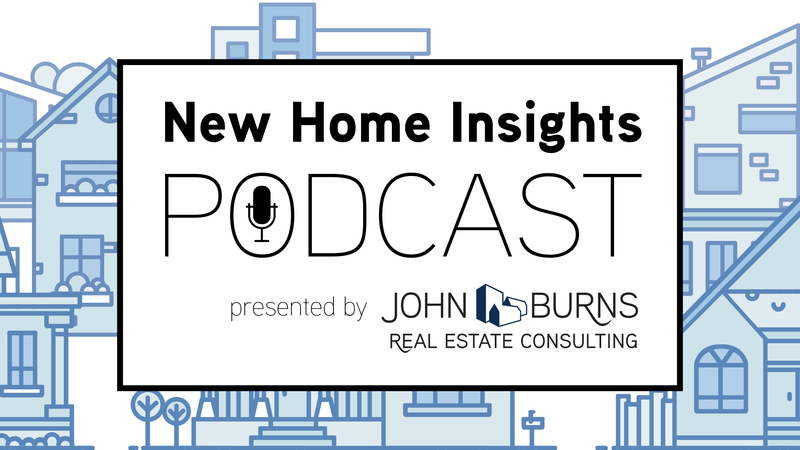 If there are any topics you want discussed on the New Home Insights Podcast please send us an email with your recommendation.